Concern is increasing that Anonymous may target critical infrastructure, and while analysts say it is possible, it is probably not likely. 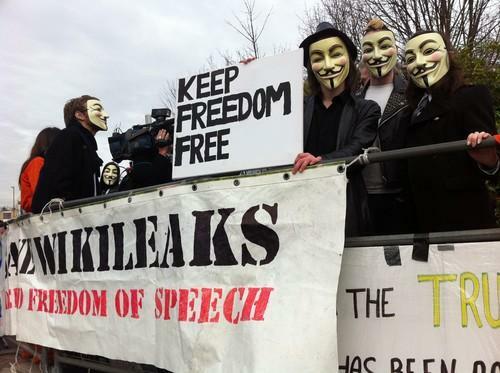 Pictured are supporters of Supporters for WikiLeaks founder Julian Assange outside a London court in February 2011. WikiLeaks won plaudits from people who want to see the workings of government exposed to daylight, by publishing a vast trove of U.S. data several years ago. Now, it's decided to expose another cache of purloined information that has decidedly less obvious benefit for the public interest. It's put up a searchable database of the documents stolen from Sony Pictures last year in a high-profile hack, using the rationalization that basically, big companies should have their dirty washing hung out just because (insert reference to military-industrial complex here). Those who can't wait to read a Hollywood executive's true feelings about a certain famous actress would probably agree. IBM has joined the growing crowd pushing for real-time cybersecurity information-sharing: on Thursday, the company opened up over 700 terabytes of data about vulnerabilities, attacks and other threats through a new cloud-based threat intelligence sharing platform called IBM X-Force Exchange. The data includes threat information based on monitoring of more than 15 billion security events per day and malware threat intelligence from a network of 270 million endpoints. China's government has given foreign tech companies a reprieve: it's suspended onerous new rules for selling into the banking sector, the New York Times reports. Companies had vehemently protested the regulations, which required them to share source code and other intellectual property. High-density servers were expected to be all the rage, but didn't turn out to be a moneymaker for AMD. The company said it is moving away from the effort it launched three years ago with the $334 million acquisition of SeaMicro, which developed a new type of high-density server aimed at large-scale cloud and Internet service providers. AMD still sees growth potential in the server market, but not from selling complete systems. The announcement came amid a slump in revenue and increased losses for the company. The Los Angeles school district wants to claw back millions from Apple over a failed $1.3 billion project to build out wireless school networks and provide 650,000 students with iPads they could use at home. Apple hired Pearson Education as a subcontractor to develop software for the iPads, but according to a letter the school district sent to Apple this week, a "vast majority" of the students have been unable to use the software. And yeah, we hear you mom: They really did want to spend a billion dollars to give the kids more screen time! This has been a busy week for systems administrators keeping up with the output of security updates to fix critical vulnerabilities. Microsoft issued 11 security bulletins covering 26 vulnerabilities across a wide range of products. Oracle released 98 security fixes spanning many business products and also issued the last free patch for Java version 7, forcing a large number of companies to either re-engineer their apps for Java 8 or sign up for extended support contracts. Finally Adobe released patches for vulnerabilities in its ColdFusion Web application development platform, Flex and Flash Player, the updates for the latter including a fix for a zero-day vulnerability. Financial traders around the world were venting their frustrations after the Bloomberg terminals they rely on for market information went offline Friday morning. The company has about 315,000 subscribers who pay about $24,000 annually for its Bloomberg Professional terminals. On World Tech Update this week, the EU targets Google, a manuscript by Alan Turing sells for more than $1 million, and a drone shoots 4K video. Moore's Law, a set of observations made by Intel co-founder Gordon Moore in an article published 50 years ago this Sunday, is the key concept underlying the progression of computers from being as big as a room to fitting into the frames of your glasses. Here's a look at back at the idea that as transistor density doubles, chips shrink in size, processing speeds up, and the cost per processor declines.